The history and vision for the future of international trade for U.S. agriculture will be the subject of the next Heuermann Lecture on Jan. 12. 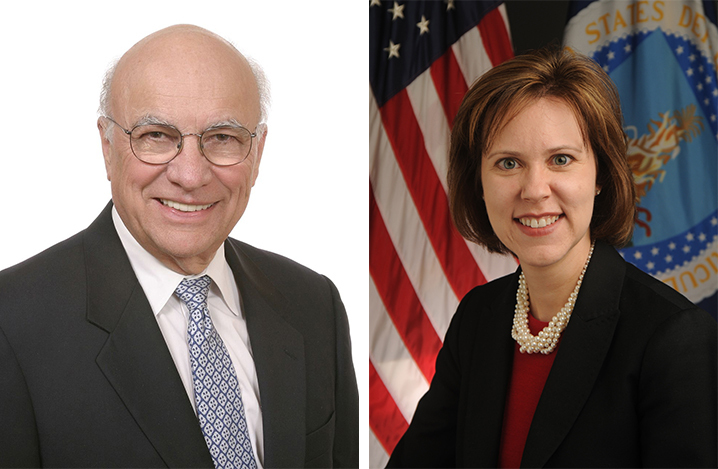 Clayton Yeutter, former U.S. trade representative and U.S. secretary of agriculture, and Darci Vetter, the chief agricultural negotiator for the Office of the United States Trade Representative, will have a panel discussion. Clayton Yeutter, former U.S. trade representative and U.S. secretary of agriculture, and Darci Vetter, the chief agricultural negotiator for the Office of the United States Trade Representative, will join in a panel discussion on international trade at the Jan. 12 UNL Heuermann Lecture. The free lecture, sponsored by the University of Nebraska-Lincoln's Institute of Agriculture and Natural Resources, will be at 7 p.m. at the Nebraska Innovation Campus Conference Center, 2021 Transformation Drive. A 6:30 p.m. reception precedes the lecture. Yeutter recently retired as senior adviser of international trade for Hogan Lovells, LLP, in Washington, D.C., one of the nation's oldest and largest law firms. Previously he acted as counselor to President George H.W. Bush for domestic policy, a cabinet-level post. From 1989 to 1991, he was U.S. secretary of agriculture and was responsible for administration of the fourth-largest department of the United States in budget terms (nearly $50 billion) and sixth largest in employment (more than 100,000). From July 1985 until January 1989, he was U.S. trade representative, reporting directly to the president on all trade matters. He was born in Eustis and spent 18 years operating a 2,500-acre farm, ranch and cattle-feeding enterprise in central Nebraska. As chief agricultural negotiator at the Office of the U.S. Trade Representative, Vetter is responsible for bilateral and multilateral negotiations and policy coordination regarding agricultural trade. In her previous role at USDA as deputy undersecretary, she oversaw the department's international activities. Before joining USDA, she was an international trade adviser on the staff of the U.S. Senate Committee on Finance. Before that, Vetter spent six years at the Office of the U.S. Trade Representative, including as director for agricultural affairs. She also was the director for sustainable development in the U.S. Trade Representative's environment office. She received her master of public affairs degree and a certificate in science, technology and environmental policy from Princeton University and her undergraduate degree from Drake University in Des Moines. She grew up in Nebraska on a family farm. Heuermann Lectures are free and open to the public. Lectures focus on providing and sustaining enough food, natural resources and renewable energy for the world's people, and on securing the sustainability of rural communities where the vital work of producing food and renewable energy occurs. They are made possible by a gift from B. Keith and Norma Heuermann of Phillips, longtime university supporters with a strong commitment to Nebraska's production agriculture, natural resources, rural areas and people. Lectures stream live at http://heuermannlectures.unl.edu and are archived at that site soon after the event. They also air on NET2 World at a later date.